The NHL has announced the four rosters for the 2019 All-Star Game today, scheduled to be held on January 26th in San Jose. Earlier today, Alex Ovechkin, who was elected captain of Metropolitan Division squad, told the league that he wouldn’t be attending and will accept the punishment of missing one game either before or after the break. Connor McDavid, Nathan MacKinnon, and Auston Matthews will represent the Pacific, Central and Atlantic respectively, as the other captains. A replacement Metropolitan captain for Ovechkin has yet to be named. One final skater spot on each roster has yet to be announced, as it will be determined by the “Last Man In” fan ballot, a concept borrowed from Major League Baseball. The format of the current All-Star Game, which requires one representative from each team on these smaller 3-on-tournament rosters, was bound to cause some confusion with the initial selections. Seven top-twenty scorers were not selected – Mitch Marner, Brayden Point, Leon Draisaitl, Sean Monahan, Matthew Tkachuk, Phil Kessel, and Gabriel Landeskog – and several will inevitably remain out of All-Star participation even after the fan ballot additions. Morgan Rielly, the league’s top-scoring defenseman, and Mark Giordano, enjoying an elite season on both sides of the puck, are two surprising omissions on the blue line. Several of the league’s top goalies are also going to miss out, ineligible for the fan ballot, including Ben Bishop, Frederik Andersen, and Andrei Vasilevskiy. The “Last Man In” will be an intriguing new addition to the All-Star process, with nominees to be named shortly, but more than a few notable names will be left out regardless. Meanwhile, the health of players like Price and Chabot for Team Atlantic and Hall for Team Metropolitan will bear watching, as those players may opt to skip the All-Star festivities, opening up more players to selection. While many people may not have noticed as much with the impressive play of rookie Miro Heiskanen, the Dallas Stars have been missing their top defenseman John Klingberg for an entire month after suffering a hand injury. The team’s top defenseman, however, is closing on a return and is expected to be back somewhere around Christmas, according to NHL.com’s Mark Stepneski. Klingberg has already missed 13 games and is not expected to join the team for their upcoming four-game road trip starting on Sunday. However, the 26-year-old hopes to begin practicing with the team when they return from that road trip. While his hand has been improving, he still has trouble of doing specific things with his hand, which includes tying his skates. However, he has gotten clearance to do more with his hand. While sitting out for the last week, Winnipeg Jets’ Josh Morrissey has been doing nothing but studying film in his off time, according to Ken Wiebe of the Winnipeg Sun. Morrissey has watched more than a dozen NHL games, including some of his own to see what’s missing from his game, while keeping an eye on future opponents. In the meantime, the defenseman has passed all of his tests, while recovering from a lower-body injury, and hopes to return to the Winnipeg lineup on Sunday. While the Chicago Blackhawks have liked what they see on the ice from 2016 second-round prospect Artur Kayumov so far in his early career, the 20-year-old picked up some negative publicity recently as the KHL announced that Kayumov has been suspended for 13 games after a hit to the head to Jokerit’s Jesper Jensen as well as punching a referee in the process. Kayumov, playing currently for Yaroslavl Lokomotiv, has 11 points and 55 penalty minutes this season. The team has just three entry-level players and all three will be critical to the team over the next couple of years. Their 2016 first-rounder, Kunin, suffered an ACL injury in April that required surgery. While he is close to be ready to return, he’s still being held out to allow his knee to fully heal. Regardless, the team has high expectations for him. He struggled to capture a full-time role with Minnesota last year, but scored 10 goals in the AHL in just 36 appearances there, while getting 19 games in with the NHL club. The team will need him to step into a full-time role as soon as he’s healthy. Eriksson Ek, the team’s 2015 first-rounder, got himself a full-time role, but struggled to put up points in the bottom-six, posting six goals in 75 games. A bigger role could allow him to take that next step. The team also has big hopes for Greenway, who the team pried away from Boston University this spring. The 6-foot-6, 226-pound winger should provide the team with a solid power forward, who could jump into the team’s top-six immediately. The team will have an interesting decision to make on Staal at the end of this season. Staal, who was coming off a disappointing 13-goal season a few years ago, signed a three-year, $10.5MM deal, which has been one of the team’s best signings in their history. Staal, who many thought might be slowing down, responded with 28 goals in 2016-17 and followed that up with a 42-goal season last year. Now at age 33, what will Minnesota do in a year when he’s 34 and in need of another deal? If he posts another impressive season, the Wild will have to pay up to keep his services. A disappointing year could mean the end of a thrilling ride. The rest of the group are full of one-year deals in which the players must prove their worth. The team brought in Fehr, Hendricks and Read to shore up their fourth line, which struggled at times last year, while the team also has a pair of veteran netminders fighting for the backup goalie spot in Stalock and Hammond. The team gave Koivu a two-year extension a year ago, but the 35-year-old is starting to fade after a 14-goal, 31-point performance last season and could be moved down a line, especially if Eriksson Ek continues to improve. Koivu still remains the all-time leader in both games played and points, however, but this could very likely be his last contract. Granlund could also be an interesting situation. The 26-year-old has improved his game over the last two season, posting a combined 47 goals and he had a career-high in assists last year with 46. His second half was also a big success as he posted 45 points in 46 games, almost a point a game. If he can keep that production up, the Wild should look good. Fortunately, the team has two more years to monitor his success before they have to offer him a new contract. Coyle is another player, who has the ability to put up big points, yet Coyle has struggled more recently, posting just 11 goals and 37 points in 66 games. However, a broken fibula could have been a cause of his on-ice struggles. The team hopes that he can bounce back and prove he belongs in the team’s top-six. Dubnyk has been solid for the team even though plenty have their doubts about the goalie. Regardless, he has played 60 or more games for three straight years and hasn’t had a save percentage lower than .918 in any of those year. The 32-year-old is locked up for three years, so the team will have to look into a long-term replacement soon as the years will eventually add up on Dubnyk. While his 2.52 GAA last year was the worst in several years, the veteran still posted 35 wins. Brodin will likely end up playing alongside Spurgeon this season and should be able to complement them well. He adds a highly-regarded defensive presence to the team’s top-four. Both Pateryn and Seeler could conceivably fill out the team’s third pairing. Pateryn may be one of the team’s more underrated signings this offseason, while Seeler impressed with his toughness and mobility in a 22-game limited viewing at the end of the year. Foligno struggled early on last year after coming over from Buffalo, but started to figure out the Wild’s system by the end of the year and was impressive in the playoffs. If he continues on that same course, he should provide the team’s fourth line with some much-needed hard-hitting. The team’s toughest contracts are the ones that will be held over the team for another seven seasons, but it’s Parise’s deal that will prove truly costly. The Wild signed both Suter and Parise to matching 13-year, $98MM contracts back in 2012. While Suter is still providing solid value (albeit his recent injury), Parise has struggled with injuries. The 34-year-old sat out most of the first half due to back surgery, the veteran came back and performed quite well during a 16-game stretch when he scored 12 goals. However, a broken sternum at the end of the year, knocked him out of the playoffs. The team hopes he can bounce back this year, while Suter also suffered a broken fibula which could have ended his career. However, he has fought back from that injury and is expected to be ready for the start of the season. Suter had 51-point season before going down with his injury. The team locked up both Dumba and Zucker in the offseason as they both received five-year deals. Dumba provides offense as he’s scored double-digit goals in three straight seasons and could find himself playing next to Suter this year if coach Bruce Boudreau gets what he wants. The 24-year-old had a breakout season as he posted a career-high 50 points. Zucker was handed a two-year “prove it” bridge deal two years ago and he responded with a combined 55 goals, and was rewarded for that with a five-year, $27.5MM contract and will stay on the team’s top line. The big unknown is Niederreiter, who had three straight 20-goal seasons, but struggled with injuries all season. If he can bounce back, his contract may not look too bad, but the team had high hopes he might take that next step and develop into a 30-goal scorer, which he has so far failed to do. The team really needs Niederreiter to show that he is as good as his contract if the Wild want to return to the playoffs for a seventh straight year. The Wild have a new general manager in Paul Fenton, but so far there has been little change. Whether he’s waiting to see if some of his players have bounce-back seasons before shipping some of them off or whether the team has too much money invested in its veterans, the team is at a crossroads. If players like Coyle, Niederreiter, Parise and Granlund can return to form, the team may be able to take that next step in the playoffs. However, the team just as easily could go the other way and start a rebuilding project around players like Zucker, Dumba and Greenway and do a proper rebuild. This will be the year that will determine which direction the team intends to go. With a new general manager in house and the fact that the Minnesota Wild can’t seem to take a step forward despite reaching the playoffs six straight seasons, many people expected Paul Fenton to do something significant this offseason when he took over. Instead it’s been a quiet offseason so far for the Wild as they have locked up some of their own players including Jason Zucker (five years, $27.5MM) and Mathew Dumba (five years, $30MM), but the team looks almost exactly the same from last season. The team did add some veteran depth when they signed Eric Fehr, Greg Pateryn, Matt Hendricks, J.T. Brown, Matt Bartkowski and Andrew Hammond. But they are only there to help the team’s bottom lines as well as add some physicality. The core of the team remains in tact. However, that’s not from a lack of trying, according to The Athletic’s Michael Russo (subscription required). In a mailbag column, the scribe writes that he’s talked to many contacts around the league who have told him that Fenton has been working the phones this summer, trying to make a deal, but has had little luck as teams often attempt to low-ball new GMs in hopes of catching a steal when the new GM is desperate to make a deal. 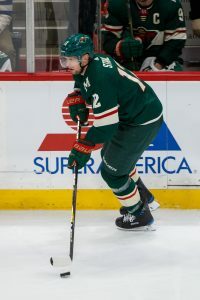 While owner Craig Leopold said he wanted to tweak the lineup after losing in the first-round this year, many felt that he wanted to alter the team’s core of Charlie Coyle, Zucker and Nino Niederreiter. While Fenton has talked about those three, it is believed he’s talked about almost every player on the team, but hasn’t found a good enough deal yet to pull the trigger. Of course, Coyle and Niederreiter are coming off down seasons, which is not the best time to be shopping them. The 26-year-old Coyle has been with the team for six seasons, but after two straight seasons in which his stats increased significantly, Coyle struggled this year, posting 11 goals and 37 points in 66 games. A lot of that has to do with injuries as he broke his fibula early in the season and then had surgery on both of his wrists after the season, suggesting he was never fully healthy. Niederreiter also suffered a broken fibula as well as dealt with a high ankle sprain, which prompted his season to slip from 25 goals and 57 points to just 18 goals and 32 points in 63 games. Neither made for good trade bait. Zucker himself put up solid numbers last year with career highs in goals (33) and points (64), but he was a restricted free agent, which many teams shy away from. Other players would have been even more difficult to move considering that Zach Parise is locked up at $7.54MM for the next seven years and has a no movement clause. Ryan Sutter is coming off a serious injury, while Mikko Koivu holds a no-trade clause after signing his two-year extension. Eric Staal, Devan Dubnyk and Jared Spurgeon all have modified no-trade clauses, but were not asked to submit their no-trade lists at the NHL Entry draft in June, suggesting the team had no interest in moving any of them. With all those issues, it’s no wonder that Fenton and the Wild were unable to shake up the roster like many thought they would. The only positive scenario is that the team, which should be healthier this year, should return to the playoffs again and might be able to turn their fortunes around from then on. The team has a number of young players, who could have breakout seasons, including Joel Eriksson Ek, Jordan Greenway and Nick Seeler who could help take the team to the next level. In a loaded article for The Athletic today, Michael Russo addresses the Minnesota Wild’s plans for the off-season with new GM Paul Fenton through his first draft and ready for free agency. While Russo speculates that the Wild could look more toward the trade market than the UFA market this summer, he does name a few player who he feels the team has interest in and are likely to be good fits. Among those named are top-six scorers – and two of the biggest names on the market – James Neal and David Perron of the Vegas Golden Knights, as well as two-way contributors Michael Grabner and Jay Beagle. Russo also adds that the team is likely to take a look at upgrading the backup goalie position. Perhaps the deepest free agent position group this summer is at #2 netminder, where some of the league’s best backups from last season, several veteran former starters, and a few young keepers in need of a change compose a large group of possibilities. The Wild used Alex Stalock as their primary backup in 2017-18 and he performed well enough, but the veteran still has a year left on a two-way contract and the team could easily stash him in the AHL if they can woo a superior option to Minnesota. While the following information could frighten fans of the Wild, particularly given the team’s interest in exploring the trade market, don’t be too alarmed. Russo reports that Fenton has requested updated No-Trade lists from starting goaltender Devan Dubnyk, top-pair defenseman Jared Spurgeon, and top scorer Eric Staal. However, Russo believes that this is just a formality that the new GM wanted to get out of the way. With Minnesota expected to be a playoff team again next season, it is very unlikely that any of these three star players are likely to be traded any time soon. Over at Rau’s alma mater, the University of Minnesota, the Gophers hope that they have two more future stars on the way. John and Luke Mittelstadt, the younger brothers of former Gopher and top Buffalo Sabres’ forward prospect Casey Mittelstadt, have announced their commitments to the university. John, 16, is a forward who produced well in his first season at Eden Prairie High School and Luke, 15, is a defenseman who will be a freshman at Eden Prairie in the fall. Like brother Casey, the Mittelstadt’s are undersized and not elite athletes, but make up for it with tremendous skill and hockey sense. They will arrive at Minnesota in 2020 and 2021, respectively, and will join the likes of Blake McLaughlin, Bryce Brodzinski and others on a top program that has been gaining some major commitments over the past few months. It was a short-lived NHL comeback for goaltender Niklas Svedberg. 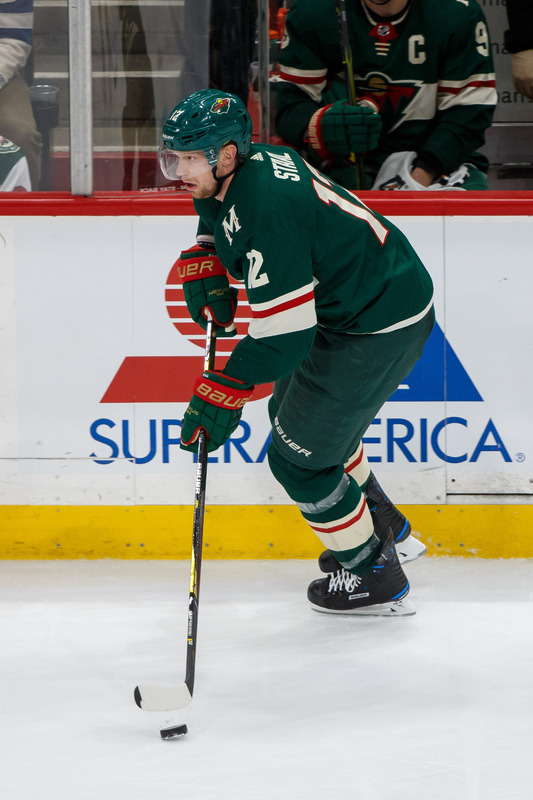 The 28-year-old free agent returned from two years abroad in the KHL with a one-year deal with the Minnesota Wild, but is now reportedly headed back to his native Sweden. A Swedish newspaper, the Kvalls Posten, revealed that Svedberg has agreed to terms with Timra IK of the SHL and two sides are hammering out the details of a contract, per GM Kent Norberg. Svedberg originally made a name for himself in Sweden, breaking into the elite ranks with MODO at just 17 years old in 2007-08. He played five seasons in the SHL, including three as a starter, and led Brynas IF to the championship in 2012. Following his success overseas, the undrafted keeper signed a two-year deal with the Boston Bruins. Svedberg entered the NHL with high expectations that a combination of underwhelming performance and a lack of opportunity has kept him from reaching. In his first year in Boston, Svedberg was blocked by the emergence of Anton Khudobin as the backup to Tuukka Rask and did not play a single game in the NHL that year for the eventual Eastern Conference champions. However, he did post top marks in the AHL. The next season, Svedberg finally made his debut, but was held to just the one impressive outing as Boston again got reliable backup play, this time from Chad Johnson. Meanwhile, his play dropped off in the AHL. Finally, in 2014-15, Svedberg was promised the backup job in Boston and re-signed with the team. He performed well, posting a .918 SV% and 2.33 GAA, but did so in just 18 appearances as Rask started 70 games. Seemingly was fed up with his role in Boston and unable to find work elsewhere in the league, Sveberg left for the KHL in 2015 and proceeded to serve as the starter for Salavat Yulaev Ufa for the next two seasons. Although he was the unchallenged starter, Svedberg’s performance in the KHL last year was the worst of his pro career and the journeyman goalie decided he would settle for a backup job in the NHL, signing with the Minnesota Wild last summer. Again, Svedberg’s luck was poor; he expected to replace Darcy Kuemper as the backup to Devan Dubnyk, but instead lost the job in camp to Alex Stalock and did not make an appearance with Minnesota this year. His performance with AHL Iowa was pedestrian as well. Now, Svedberg seems to be content to just head home to Sweden and make his living as a starter in the SHL. He has his work cut out for him with Timra, who return to the country’s top league after being relegated back in 2013. The team has some promising young talent up front, but the adjustment to tougher competition will be much smoother with Svedberg in net. With that said, a recently promoted team is unlikely to be immediately successful and Svedberg may not put up flashy numbers with the team. As such, it may be hard for him to work his way back into the international spotlight. The NHL may have seen the last of Svedberg. The Ottawa Senators got off the schneid last night, defeating the New York Rangers 3-2 for just their second regulation win in 14 games. Perhaps that can build them a little bit of momentum as they head into the NHL 100 Classic on Saturday night, outside against the Montreal Canadiens. As the Senators and the rest of the league prepares for an eventful weekend, we’ll keep track of all the minor movement right here. Check back throughout the day. The Minnesota Wild have recalled goaltender Steve Michalek for tonight’s game against the Toronto Maple Leafs. Devan Dubnyk is out with a lower-body injury suffered earlier this week, meaning Alex Stalock will get the start against his former (albeit for a short time) team. Dubnyk underwent an MRI, meaning more information should be released today on the extent of his injury. The Winnipeg Jets have moved Dustin Byfuglien to injured reserve, while recalling Julian Melchiori from the AHL. Melchiori played 18 games for the Jets last season, recording two points, but has been stuck in the minor leagues this year. Michael Leighton is on his way back to the Tucson Roadrunners, after being a salary cap call-up for the last few days. Both Antti Raanta and Scott Wedgewood are healthy, but the Arizona Coyotes flirt with the cap floor all season long and sometimes need to call up players just to make their roster acceptable. With Chris Tanev unavailable due to injury, the Vancouver Canucks have called up Ashton Sautner from the AHL. Sautner would be making his NHL debut should he get into a game, after spending the last two-plus years with Utica. The 23-year old has three points in 21 games this season. Oilers goalie Cam Talbot is aiming to return to Edmonton’s lineup within the next week, notes Postmedia’s Robert Tychkowski. He acknowledges that he may not be 100% recovered at that time but as long as there’s no risk of re-aggravating his injury, he will be prepared to play. That may take some of the pressure off GM Peter Chiarelli who has been scouring the league for extra goaltending depth in recent weeks. As it turns out, one of the goalies he was looking into – Winnipeg’s Michael Hutchinson – happens to be hurt himself now on a day-to-day issue. Wild goaltender Devan Dubnyk has been ruled out of playing on Thursday against Toronto as a result of a lower-body injury sustained on Thursday night, head coach Bruce Boudreau told Dane Mizutani of the Pioneer Press. Dubnyk told his bench boss that he doesn’t think it’s a particularly bad injury although an MRI will ultimately determine the extent of it. Unless they think Dubnyk can dress as the backup, Minnesota will have to call up a goaltender before puck drop tomorrow, likely one of Niklas Svedberg or Steve Michalek, their current tandem with AHL Iowa. Blues goalie Carter Hutton took part in practice on Wednesday which signals that he is nearing a return to the lineup, notes Jim Thomas of the St. Louis Post-Dispatch. Hutton is eligible to be activated off injured reserve on Friday and could be in line to start one of their upcoming back-to-back games against Winnipeg over the weekend. Stars goaltender Kari Lehtonen has seen his workload reduced this season with the addition of Ben Bishop but told Mike Heika of the Dallas Morning News that he’s happy with where he is even with his role being reduced. The 34-year-old has posted a .909 SV% heading into Wednesday’s start against the Islanders, his highest mark since 2013-14. Speaking of that start, Lehtonen set a new NHL record for most appearances made by a Finnish-born goaltender with 624, passing Miikka Kiprusoff. No trade clauses seem to have become the “in-thing” in negotiations as NTC’s are more prevalent than ever. Many general managers are forced to offer them to entice free agents to come to their teams. Other teams just give them to their top players to prove their loyalty to that player. For instance, the Tampa Bay Lightning have eight no-trade clauses on their roster, but that’s normal for a team that is expected to contend for a Stanley Cup. However, what about the Detroit Red Wings. The struggling franchise is tied with Ottawa for a league-high 10 no-trade clauses on their roster for a team that’s already capped out with nothing to show for it but a roster of aging, overpriced veterans. The best option for Detroit and general manager Ken Holland, who handed out those no-trade clauses would be to trade off their veterans and start a massive rebuild. Can’t do that, according to Yahoo Sports Greg Wyshynski, who writes that Detroit is in a tough situation compared to other teams. One key to the way general managers use no-trade clauses is how they are utilized and with all of their no-trade clauses, the team will be hamstrung for many years. Holland and the Red Wings have given full no-trade clauses to Justin Abdelkader, who has three more years of a no-trade clause before it becomes a modified trade clause, but the 30-year-old is locked up for another six years. Gustav Nyquist has a full no-trade clause for the two years remaining on his contract. Darren Helm also has a full no-trade clause through next season, although that can be voided beyond that if he fails to be among the team’s top-nine forwards or if the team doesn’t make the playoffs. However, again, he has a four-year deal. Four defensemen have full no-trade clauses, including Mike Green, Danny DeKeyser, Jonathan Ericsson and newly signed Trevor Daley. Other than Green, all of them possess full no-trade clauses for the next year, but eventually turn into modified no-trade clauses in 2018-19 or later. To make matters even more difficult, Detroit also has three players with modified no-trade clauses, including Frans Nielsen, Niklas Kronwall and goaltender Jimmy Howard, that will only make a rebuild more challenging for the Red Wings. Perhaps the biggest problem, according to Wyshynski, is that seven of the 10 no-trade clauses are in the hands of players that are 30 or older and whether there was a need to give one this offseason to Daley, who many viewed as a questionable acquisition in the first place, let alone that they gave him a two years worth of a full no-trade clause to go with his three-year, $9.5MM contract at age 33. While some no trade clauses are unavoidable and even necessary to get a player to sign on the dotted line, it’s critical to know when to offer one and when not to. Wyshynski uses the Minnesota Wild as an example of a team who has six no-trade clauses on their roster and used them wisely. They handed ones out to Zach Parise, Mikko Koivu and Ryan Suter, where they were critical in negotiations and are franchise-type players. They used one on veteran Eric Staal to convince him to come to Minnesota last year, which worked out quite well. Finally, defenseman Jared Spurgeon and goaltender Devan Dubnyk each received modified no-trade clauses, but again, both are key pieces to the team’s success. That’s how it should be done. The question is, how long will it take for Detroit to recover from these long-term contracts with all these no-trade clauses in place. Of course, after the Daley deal, it doesn’t necessarily mean that Detroit has learned from its mistakes anyway.